At MTS, we are deeply conscious of our responsibility to society and the environment. Our sustainability policies reflect our core values as a company. We strongly believe that a responsible and ethical business is a more successful one over time and delivers long-term value for our stakeholders. We aim to lead our sector not just in financial performance, but also through the strength of our sustainable and responsible business practices. For our customers, our service is crucial to their livelihoods; connectivity and digital services allow them to fully participate in their family and community life, to excel at their place of work, relax and enjoy in their environs and, if necessary, find aid and support when needed. We see accessible connectivity as a basic right and aim to fundamentally improve the lives and safety of individuals and communities by continuously implementing innovative technologies and providing ever wider range of accessible services. In all our business dealings, we maintain strict transparency policies and actively involve all stakeholders in an open dialogue. In 2017, MTS adopted a comprehensive CSR Strategy to formalize our sustainability goals and provide a 360° CSR evaluation framework. The strategy reflects global best practices and internalizes the UNO's sustainable development goals and GRI recommendations, while our strategy builds upon our own 25-year experience serving our local communities. Please read CSR Strategy here. Sustainability is a fundamental element of our Group 3D Strategy, and the principles outlined are integrated into all areas of our business. Our approach takes into account the interests of all stakeholders, including government authorities, consumers, personnel, vendors, shareholders, and local communities. 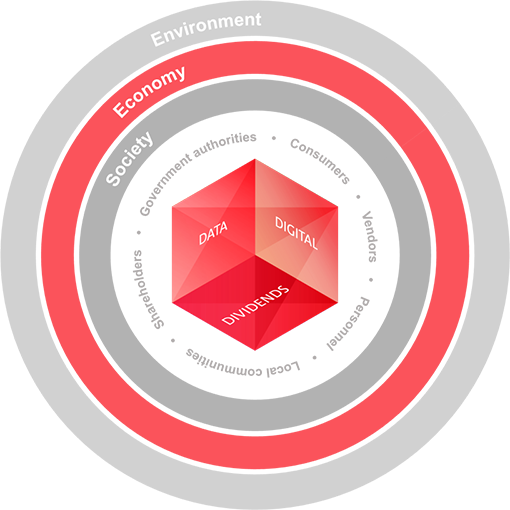 The Strategy is focused around three areas: society, economy and environment. MTS is commited to the implementation of the project related to 17 UNO's Sustainable Development Goals (SDGs), officially known as Transforming our world. Please observe key facts and figures of MTS 25 years of sustainable growth here. Regularly reporting on the impact of the company’s operations on society, the economy and the environment.